On shining a light on those who spend their evenings trying to make a better life for themselves. Although Melissa might be surprised how compelling her pursuit of a high school diploma at the age of 57 actually is, it’s become evident after two features that Cohn has the ability to quietly grab your attention by capturing the small, quiet and dignified moments of striving in places that are rarely seen, let alone on the big screen. His first film, “Medora,” a collaboration with fellow Midwesterner Davy Rothbart, found a small-town high school basketball team in Indiana that could take pride in being a rallying point for a community on the verge of cultural irrelevance while his second, “Night School,” ventures into the metropolis of Indianapolis to track three people — Melissa, the 26-year-old fast food employee Shynika, and Greg, a single father who can can clean up a spotty criminal record by getting his high school diploma — using their limited off-hours to take Algebra courses and work towards completing high school by passing a final exam. With considerable compassion and empathy, Cohn weaves in and out of the trio’s daily lives, showing how the rekindled initiative that has them on the verge of becoming high school graduates has seeped into other aspects of their lives. As one watches the already gregarious Melissa taking an interest in a fellow classmate around her age and Shynika motivated to join the “Fight for $15” movement, while Greg just tries to corral the strength to endure a series of setbacks for his immediate family, the small but meaningful accomplishments begin to accumulate in power, both in their lives and as cinema. Following the film’s premiere at the Tribeca Film Festival last year, “Night School” has slowly but steadily building admirers at festivals around the country and on the eve of its theatrical release, Cohn spoke about how he was first drawn to the idea of making a film about a deferred education, his full immersion into a community to find such stories and why he doesn’t regard himself as a social issue filmmaker. I love making movies in the Midwest, because it’s where I’m from and I feel like it’s a really interesting part of the country that seems to mystify people, especially politicians, so I’m always happy to shed some light and give some folks a forum. 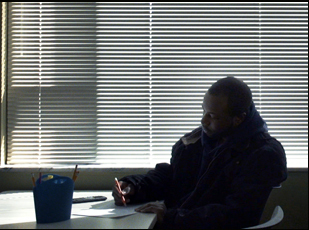 For “Night School,” I had contemplated doing a film on adult education [because] I thought there was something really interesting about people going back and facing their fears about education. I started doing some research and was looking around at some different schools to see what I could find and coming up short to find anything very inspiring, but then I was watching the PBS News Hour and there was this one-minute segment about this guy in his fifties in this low-income neighborhood in Indianapolis, going back to get his high school diploma and I thought, “That’s it! That’s the film I’ve been thinking about this whole time” and it ended up being in Indianapolis. So I moved there and was there for about eight months. Since you also embedded in a community for “Medora,” were there certain takeaways that you applied to this when you set up camp to make this film? It’s the only way I really know how to do it. I’ve talked to other filmmakers who edit as they go or will go back [to visit their subjects] for smaller amounts of time, but usually when I go into something, I want to just throw myself into it and completely block everything else out. This was the only thing I did for those eight months. I wasn’t taking any other jobs and it’s really a film that relies on access and intimacy and really making sure that you’re there for these moments that happen rather than having people talk about what happened to be successful, so to me, the only way to capture that experience is to be there and to live with these people and that’s what I did. How did the film coalesce the three people you focus on – Greg, Melissa and Shynika? Each one of them had a unique story of why they went back and each of their stories was very different than the other. I was also looking for stories that were emblematic of my overall experience. The school there is 97% African-American and just spending time in the school, there’s a lot of single parents and there’s an older section of students that are going back to mark it off their bucket list, so I was just trying to go and condense my experience and these three characters were the best embodiment of my overall experience. There were 300 students at the school and we whittled them down – we probably interviewed 75 people [to start] and then it was 15 [we followed] and then eventually seven [before] it came down to three.‎ Someone like Shynika is just really interesting to talk to – she’s really vibrant and expressive and just someone who you really want to engage with. Melissa’s the same way. I remember being so intimidated by her for so long, but she was just so heartfelt and so gracious, there was just something about her I was really drawn to. Usually, if I’m drawn to a character, I hope that others will be too. I worked with a really small crew because I knew it was going to be such a long shoot and I wasn’t going to be able to afford a full two cameras, a sound guy and a production assistant. So it was just going to be me and my director of photography Zach Shields, who’s also a producer on the film and a jack-of-all-trades, and he shot the majority of the film, but I would shoot sometimes, and I would do sound and he would do sound. We just basically decided we wanted to do everything because when you have a film with intimacy like this, especially in that part of the city in that neighborhood, you don’t want to be rolling around with a big crew with a boom mic and lights, so we just tried to scale back to be as minimal as possible. Most of the scenes are shot on one camera. Zach was able to do some incredible stuff with one camera, really anticipating where to be and we really got into a groove and worked well with each other. It was just he and I living in an apartment there for eight months, storyboarding, doing character development and putting together the structure of the film and then when we came back to New York to edit, I worked with a really great editor Thomas Niles, who edited “12 O’Clock Boys,” which is one of my favorite movies. We had some great conversations during the filming and he understood what I was going for. [Thomas] and I edited the film together and we split up the characters – he took two characters and I took two characters and we edited on our own and it came together. One of the things that is well-told, but not overt is showing both how the system has failed these people in some respect and how a community infrastructure has been built up to some degree in its place. Is that difficult to articulate? You can tell some of the support systems are there, but I didn’t want to make it part of the narrative, [but instead] just part of the world that they were living in. It was always a challenge of the film that I understood really early on that people don’t watch people do math, so how do you use the school as an entry point into these people’s lives? Then when you’re with them outside of the school, how do you connect their outside stories with what’s happening inside the school? I probably could’ve done more on the school – in earlier cuts, there’s more about the school, the way it functions and the teachers – but as we started to watch cuts of the film, I quickly realized that people’s eyes glazed over when that stuff came on. Unless you’re really interested in education, that doesn’t really interest people, but what does are the human stories, so what I tried to find were the universal stories [where] although these people are living in a very specific place and going after a very specific goal that most people can’t relate to, we’ve all felt overwhelmed like Greg or that nobody’s listening like Shynika. Did you go in with certain ideas about what this would be that changed over the course of filming? I always wanted the film to be a journal of how hard it is to pull yourself out of poverty. That was the number one idea and then you get [a little] detoured from that and come back to it, but as a filmmaker, I probably work a bit different than other “social issue documentary” filmmakers. And I really don’t like social issue documentaries to be frank, and I think this goes back to why I ended up spending so much time [in Indianapolis to film “Night School”]. I don’t really look for characters that are going to quantify a particular political idea that I have in mind. I didn’t go in saying I’m going to go in and try and find someone who’s trying to get their record expunged or someone who was involved in the “Fight for $15″ campaign. [In general] I didn’t want to pigeonhole myself looking for specific stories. I wanted to be open to whenever there was a great character. With Melissa, for instance, I didn’t really pinpoint her story until she met [someone] and ended up going on those dates [you see in the film]. I followed her for two or three months and I knew she was an interesting character and I was trying to figure out what was at stake for her, so it was a slower process, but ultimately, you see the fruits of it hopefully. The only thing I had going in [to the film] was that there were going to be characters [who] were either going to graduate or they weren’t and they were going to have something in their way. Other than that, I [just] wanted it to be engaging and thoughtful storytelling and have there be some stakes and some great characters. What’s it been like bringing this out into the world? It’s been great. I tell people all the time, “It’s not the sexiest of films. It’s about three people in the inner city going back to high school,” which reminds me of that nightmare that you have in the middle of the night with a cold sweat [where] you forgot to finish your final exam. But I love small, intimate documentaries, I love making documentaries that I want to see and I don’t necessarily see people making films like this anymore. They’re not the most commercially successful films, but in general, there’s a lot of people doing amazing things that don’t get the credit that they deserve and [these are] the stories that I love telling about everyday Americans and people living on the fringes of society, so to be able to give these three folks just a little bit of credit and a little bit of shine has been really great. They all love the movie and have been over the moon with this whole experience. “Night School” opens on June 9th in New York at the IFC Center and in Los Angeles at the Laemmle Music Hall on June 23rd. Interview: Margaret Byrne on Coming of Age with "Raising Bertie"
Pingback Interview: Andrew Cohn on Making a Spiritual Stop at "Destination Park"